My current story project is a complex one. It is the first of what I will hope to be a series of interconnected stories. The story is told from multiple viewpoints and in some cases the some of the character have no idea what the others are doing. It spans a period of about 60 days and there are flashbacks included, but the sequence of events is also told slightly out of order. Finally, as this is the first of several stories to take place in this universe, some of the timing of the background events are key to the later stories. With this in mind, I found myself needing to build a timeline to keep track of the actual order of things. I know that there are probably software packages out there I could find that would help me with this, but it occurred to me that Scrivener might be able to help me with this task. And why not? It works well for just about all other aspects of my fiction-writing. With a little thought, I might be able to make it work for this, too. In fact, I did make it work for this. It is not the most sophisticated timeline manager in the world, but it suits my needs. Here is how I went about doing it. 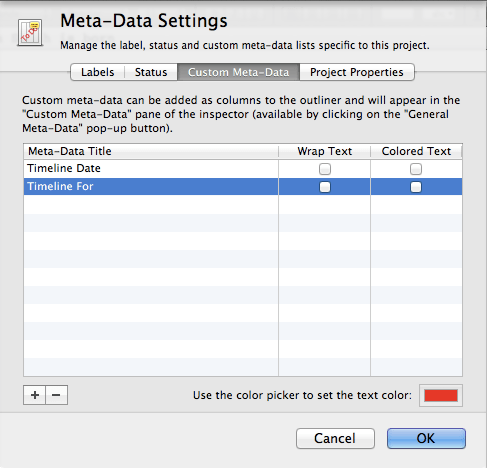 Scrivener 2.0 introduced custom meta-data fields for a project. These are arbitrary fields that can be added to a project for unspecified purposes. I decided to make use of this feature in my timeline solution. I clicked the Custom Meta-Data tab and then clicked the + button at the bottom of the panel to add a new field. I called the field “Timeline Date”. You can see this illustrated above. For each scene, I gave a date during which the scene takes place. For things to sort correctly the format of the date is important. 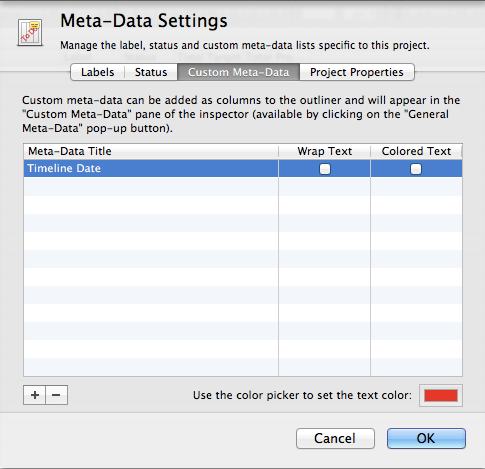 Scrivener’s custom meta-data fields are essentially character fields. So for sorting to work out the way I wanted it, I used dates in the following format: YYYY-MM-DD. You can see this illustrated in the screen capture above. Now, this doesn’t give me the ability to calculate the time between two events, but it is good enough for my purposes. Plus, if I add a scene in Outline Mode while sorted by Timeline Date, that scene will fall into its proper chronological order once I add the date to the newly added scene. To remove all of the applies sorts, I can click the Title and Synopsis field header three times. This technique worked well for me because it allows me to temporarily re-sort the scenes to see what order things actually happen in. Then I can remove the sort, or move the scenes around in any order I like for narrative purposes, but always be able to get back to that chronological sort. It also allows me an easy way to reference when things happen in relation to one another. 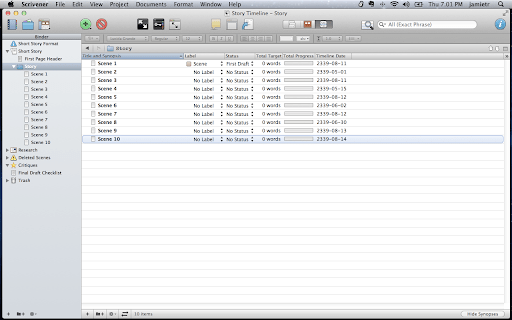 In other words, it documents my story timeline. As I said, this story is the first in a series, and there is a background of events that will be important to later stories. To make this work, I used a similar technique in a slightly different way. First, I created a new project while I called my “Story Background Bible”. This Scrivener project is used solely to build the timeline of events that make up the overarching universe in which the various stories take place. I added my Timeline Date custom meta-data to the project, but I also added another piece of custom meta-data I called “Timeline For” which I use as a way of categorizing what the particular item is for–a specific character for instance. As the various stories evolve, I can continue adding events to my master timeline and those events can be used to make sure things are consisten in the various stories. I can sort this by Timeline Date to get a picture of how all of the events relate. I can also sort first by timeline date and then by Timeline For to see how events fall for, say, a given character. For complex sets of stories, novels or series of novels, you could imagine hundreds of items on the list, some characters, others events, others notes for key scenes that you might want to illustrate. Again, Scrivener does not have the ability to calculate the time between events, but I can eyeball that if I have to. 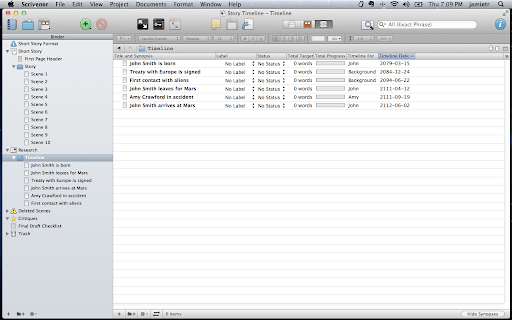 I was just glad to realize that I could create and manage my timelines within Scrivener. It goes to show you just how powerful the tools that the application provides can be. In my current story, this has been an immense help and my background “Bible” is growing every day. In fact, this technique seems so flexible (you can always add more custom meta-data fields as needed, for instance “Location”) that I could almost imagine George R. R. Martin being able to build his entire Song of Ice and Fire history, including battles, key historical events, births, deaths, etc. using this technique within Scrivener. My background isn’t nearly that complex. Ask and ye shall receive…? still at the developing stage but already downloadable in beta. I am not affiliated to the author of Aeon, i just love what he is trying (and apparently succeeding) to accomplish. Terrific solution for managing timelines. I hadn’t spotted Scrivener had added meta data. This opens hip a whole world of possibilities. Thanks for blogging about it, Jamie. This is great – I would love to use aeontimeline but I’m on windows, and aeon hasn’t produced even a beta version I don’t think, whereas Scrivener (god bless it) has. Sorry, i hadn’t realized Scrivener is not Mac-only anymore. I heard that MacOS can run on some PCs, though, so may be that is a possibility for you to try Aeon if you wish to do so? Cheers. Nathalie, I didn’t know about Aeon Timeline, but thanks for calling it to my attention! Thanks for the article, Jamie. This is precisely what I was looking for. I’m not sure I would’ve thought of using metadata to organise the timeline like this (which is annoying, because, like all good ideas, it’s obvious in retrospect). Liquid Story Binder works on Windows, is a viable competitor to Scrivener, and has a built-in visual timeline feature. It takes some time to learn, but in my opinion, it is worth it. The problem with Aeon is that they don’t have a Windows version yet… I want to be able to do this in Scivener for now, so thanks! Seems like I can’t help but run into Jamie wherever I go. Evernote, Paperless Ambassador, Scrivener, you’re everywhere! I am in the process of planning my next novel for Camp Nano (clipping and working through character development with Evernote, mindmapping with Freemind), and since I am still fairly new to Scrivener, was looking for a way to track my story’s timeline there, having it integrally connected to the scenes, without having to track it separately in another document. This is just what I need! Thank you as always! Yeah, I suppose I get around. I’m glad it helps! Actually, I’ve been using Scrivener even longer than I’ve been using Evernote. You can find the bulk of my Scrivener posts here, if you are interested. Dang! I just went into Scrivener for Windows to start building my timeline for my Camp Nano novel (Monday!!!) and found that Scrivener for Windows doesn’t utilize Custom Meta-Data fields. You’re stuck with the two drop-down labels and keywords. Neither of those will allow me to do a detailed timeline (I supposed keywords would, but I don’t want that many individual keywords in my project). So, browsing over the structure of the Scrivener project, I have decided that the first word on my Synopsis card will be my timeline date. I never sort by the synopsis description anyway. Arggh! Scrivener Windows will also not sort by column in outline mode. Great post! I’m writing a thriller novel with flashbacks and I’ve just hit 20,000 words and was starting to get lost flipping back and forth through my chapters. This will make things a damn sight easier. I bought a new MacBook Air in time for Nano 2013 and installed Scrivener for Mac. I am now revisiting this instructive article in order to set up my Timeline metadata. Also set up metadata for POV Char and Setting, so I can track all of that in my Scriver outline and not have to have a separate Excel spreadsheet to track things. Wow! Thank you so much. I have spent three whole days over the past six months of writing trying to get the timeline of my ms into Aeon Timeline, in order to help me ensure that the chronology of events in what I am writing is sound. I love the idea of Aeon, but the solution that you describe, using custom metadata, is much more effective and efficient for me. Thank you so much!